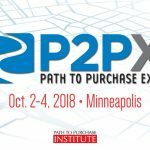 KNOXVILLE, Tenn. (Sept. 14, 2018) — Aisle Ahead, Inc. announced today it will attend the 2018 Path to Purchase Expo being held at the Minneapolis Convention Center in Minneapolis, MN October 2-4, 2018. Aisle Ahead is a solutions provider for grocery retailers, GPG brands, and smart kitchen appliance manufacturers to enhance the consumer grocery shopping journey. Aisle Ahead’s solutions are custom-developed and designed to compete with the rapidly changing world of grocery and meet growing shopper expectations by providing personalized digital experiences. The Path to Purchase Expo includes attendees such as Kroger, Walmart, and Coca-Cola and exhibitors of industry partners and solutions providers, as well as a full agenda of networking opportunities, presentations, and seminars throughout the duration of the event. Headquartered in Knoxville, Tenn., Aisle Ahead, Inc. delivers a proven digital commerce platform paired with sourced content, enabling grocers, brands, developers, and individuals to connect and interact with personalized shopping experiences. For more information visit aisleahead.com, bigoven.com. Aisle Ahead is attending Groceryshop in Las Vegas!